Is the Fire Phone for business users? 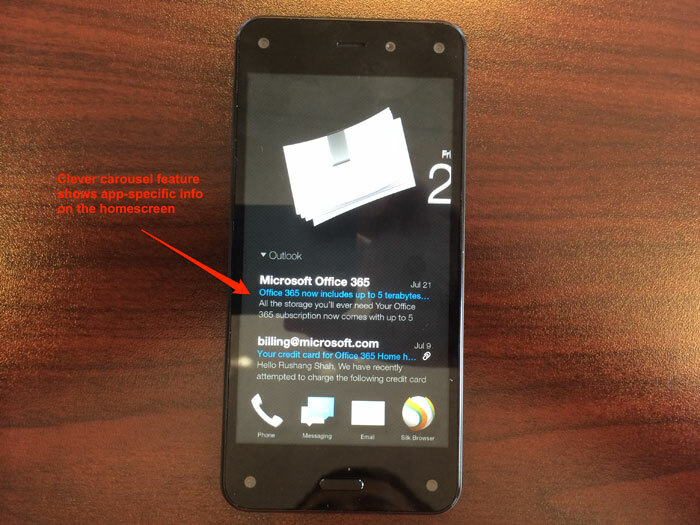 This review focuses on business productivity with the Amazon Fire Phone. TLDR Version: Fire Phone’s stock apps for Email, Contacts, Calendar, and Tasks are amateurish when compared to Galaxy S5. A shadow behind every text heading that changes dynamically with phone movements will annoy business users. The 3D Dynamic Perspective feature, while cool, distracts from flat-design principles the mobile industry is pivoting to. 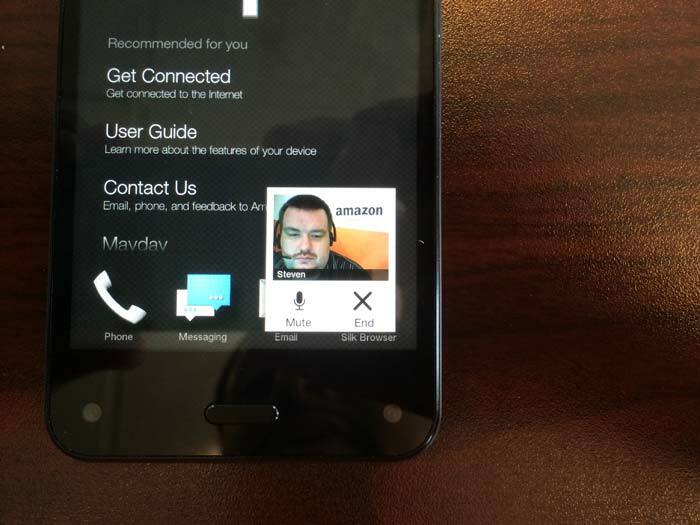 One clever feature on Fire Phone is snippets on the homescreen. You can see 2-3 recent emails on the homescreen. This snippet area is app-specific, so useful snippets show on the homescreen for every app. Saves a lot of time. Fire Phone packs new software and visuals but lacks the streamlined experience business users expect from $200 phones like Samsung or HTC. 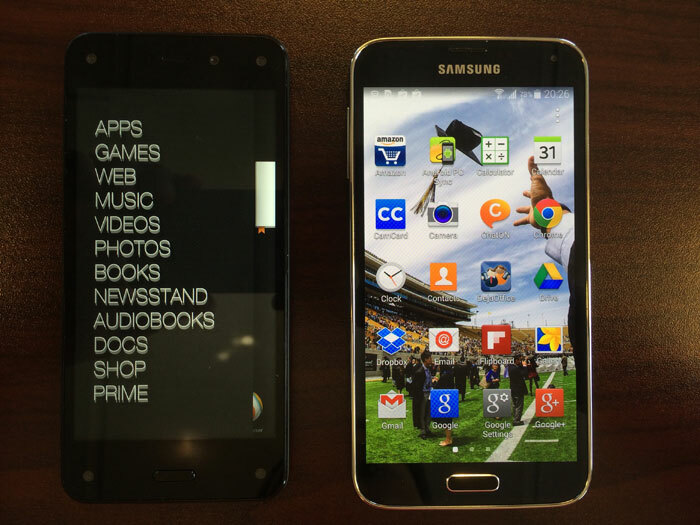 Future versions of Fire Phone will, undoubtedly, arrive more polished. Hat tip to Amazon for foraying into competitive territory and establishing their unique mark based on software. While the Appstore has categories, it fails to include a category for Business. Huh? Android historians will recall early versions of Android Market (now Google Play Store) also lacked a Business category. Perhaps this will come with time. 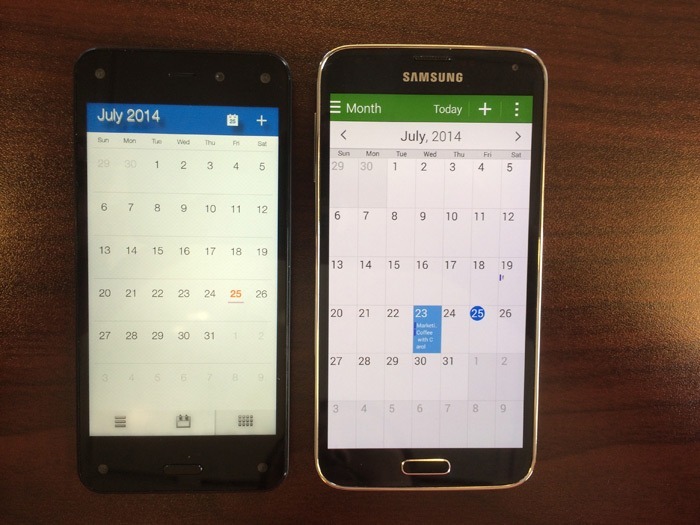 Fire Phone’s stock calendar app is sleek and mirrors the Galaxy S5. The one drawback in Month view is that you cannot determine how many appointments you have for a given day without tapping on the day and entering Day view. On GS5, each appointment comes with a snippet so you know at a glance how busy your day is. 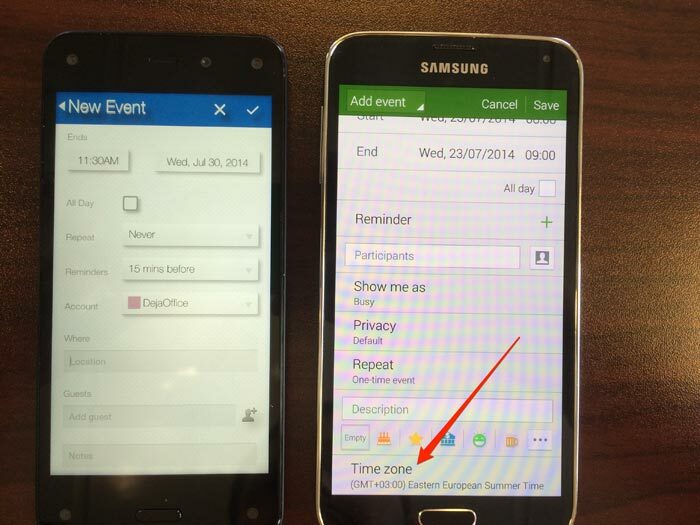 Both devices have common appointment fields like Start/End times, Location, and Attendees. The GS5 lets you select Timezone, which might be important to travel warriors. Also, the Location field on GS5 has a Google Maps icon that lets you use a map to pick a location. Fire Phone’s Location field is text entry. 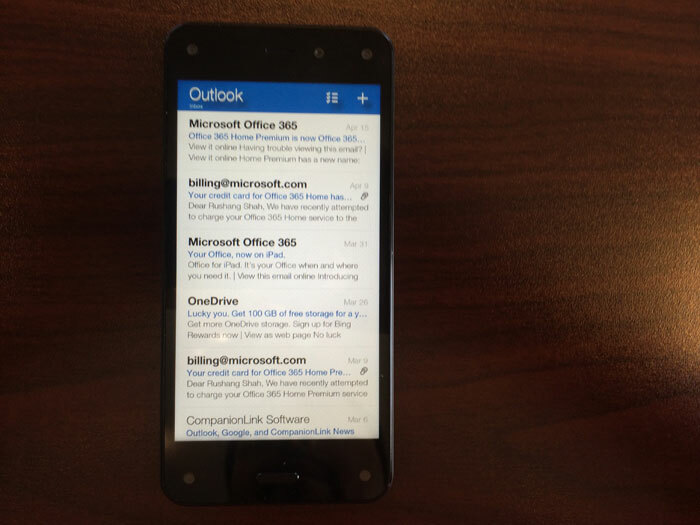 Fire Phone has a clever homescreen snippets feature that shows your latest email messages. Because Fire Phone use a carousel theme on the homescreen, they use the space below the app icon to show you snippets related to your app. The carousel for Settings, for example, will show you popular settings. Fire Phone’s email app borrows font-styling from iOS and is better than most stock Samsung or HTC mail apps. I was able to set up my Outlook.com account in seconds. ActiveSync accounts are fully supported, as this BusinessInsider article confirms. Swipe on the left edge of the homescreen on Fire Phone and a convenient slider emerges. You can access popular features of your phone right from this menu. What kills the experience is the 3D texture behind the letters. As you can see from this image, it adds a subtle layer of “blur” around the text which may drive business users nuts. Fire Phone’s personal help feature works. I was able to get “Steven” online with me in less than 30 seconds. During the wait, a message reassures me that Mayday only shares my screen and not anything through my forward-facing camera. The reaction from the business community will be interesting to monitor. On one hand Mayday is a lifesaver for professionals who need to fix something immediately. On another hand, being one-click away from someone viewing what’s on your screen may be troubling. You decide. 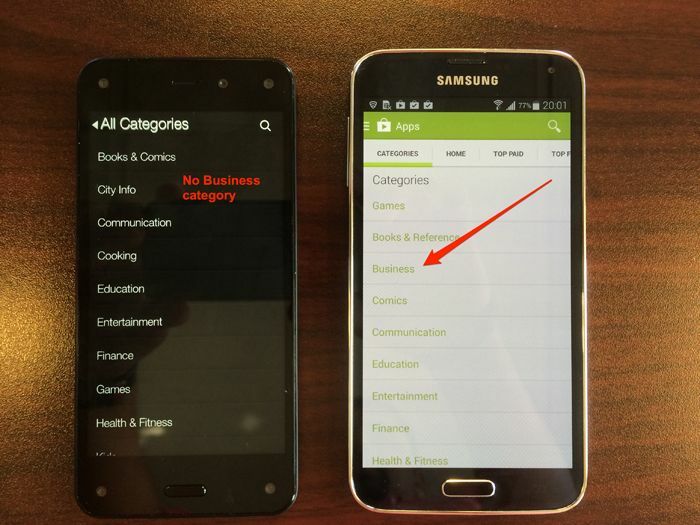 Fire Phone v1 is naive for business users. If you like the latest technology and a new spin on software gimmicks, try it out. You might enjoy their fresh approach. If you want a mature Android phone, the Galaxy S5, HTC One, or a similar Android unit earns my $200. Google’s notice appears to imply more than we are not going to support this product. It means the sync functionality may cease due to a change at the API level (programmatic). Google appears to be forcing a shut down of Calendar Event sync between Google Calendar and Outlook Calendar. This gives existing users 20 days to scramble to find a solution. There are many on the market. Choose one that matches your needs for features, use on multiple PCs or in a household scenario, and technical support options. Don’t overlook the support options. Many business users don’t have time to post questions on forums and moderate answers. They want the ability to pick up the phone and talk to an expert to get answers and their Google integration working. Support is a valuable consideration to the business community. CompanionLink for Google is our product that comes with free telephone support and handles two-way sync between Google Calendar, Contacts, Tasks, and Groups and Outlook contacts, calendar, tasks, and categories. The product can also sync multiple Google Calendars to Outlook. Members of the same household can use one license, and business users can install the product on their home and work PCs. Updates are always free. Gmail, Google, and all Google Apps accounts are supported. Outlook 2013, 2010, 2007, 2003, and 2000 are supported. The product is available as a one-time license for $49.95. Enter ALTGCS on the order form and save $10 on your purchase. If you wish to purchase 20+ licenses for your organization, email us to get a volume purchase discount. Here’s a full list of data CompanionLink synchronizes. 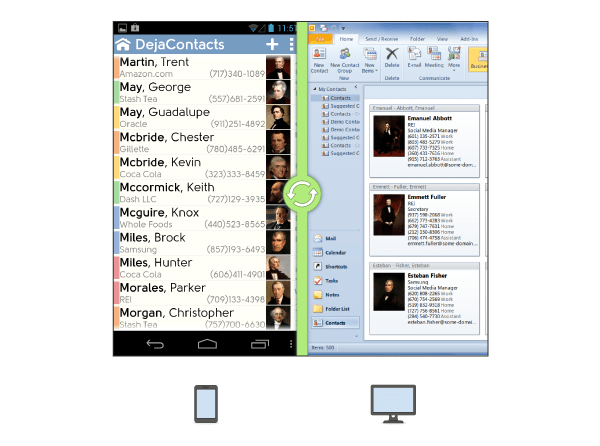 Turn the Samsung Galaxy S5 into an extension of your office by installing the DejaOffice app (free) and integrating with Outlook. Choose our cloud push sync for an automatic approach to updating data. Or, use our USB or Wi-Fi options to sync between Galaxy S5 and Outlook contacts, calendar, notes, tasks, categories, and journal entries. This is a cost-effective and secure alternative to hosting data in Microsoft or Google’s cloud. Many people try to configure Samsung Kies to sync with Galaxy S5. Users have recently reported missing sync options, missing data, and general connectivity trouble when trying to synchronize. You can read about these problems here, here, and here. You can also read about one USATODAY.com editor’s experience using Kies. If you value your Outlook data, sanity, or just need a solution that works out of the box with the new Galaxy phone, try CompanionLink. It’s been downloaded more than 1.2 million times and is the #1 independent PC suite for Android sync with Outlook. 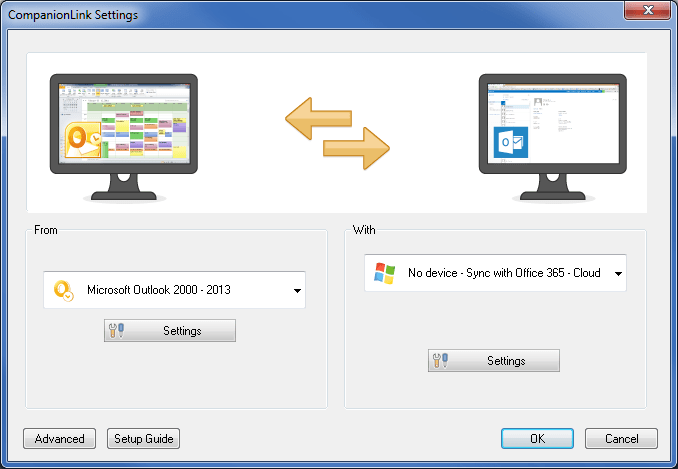 CompanionLink’s configuration lets you choose which Outlook data to sync. Toggle Contacts, Calendar, Tasks, Notes, and Journal. Advanced data such as Categories will also sync so you have the same data sets and view options on your Galaxy as you do in Outlook. Choose from two-way sync or limit it to just one-way transfer. You can even select the sync direction (Outlook > S5, or S5 > Outlook). If you have multiple Outlook PST files and folders, you can select which to sync. Let’s say you have an iPad and use iCloud to keep it synchronized with Outlook. Your Outlook client will have your default Outlook Contacts/Calendar folder (PST file) as well as a separate iCloud Contacts/Calendar folder (PST file). The iCloud folder is installed by default when you install the iCloud software from Apple. It’s important that you are able to choose the right Outlook folders to sync with Galaxy S5 so you do not accidentally mix data (such as personal data with business data). You can choose which specific Outlook Categories to sync with S5. Many professionals store leads and clients in the same Outlook Contacts file under different categories. Or, they store Personal and Business data under two categories. It’s important to use a PC sync suite with the flexibility to select which Categories to synchronize with your Galaxy S5. You can pick how you want to synchronize. CompanionLink allows sync to Galaxy S5 over USB, WiFi, DejaCloud, and using a Gmail account. Each sync method has its merits; click here for a complete discussion on this. No other Android Outlook app offers this breadth of sync options to fit the needs for security and convenience. CompanionLink extends free phone support and email support to Galaxy S5 owners. Visit this page for help if you need to speak with us. You can also purchase a $49 RunStart package that schedules time with a CompanionLink technician who will log into your PC and set up the synchronization. This guarantees a correctly configured Galaxy S5 to PC sync and the peace of mind knowing your Outlook database isn’t being accidentally corrupted. For Galaxy S5 – we are excited to see the announcement of the next Galaxy series phone. I carry one, and I hope you do too. The S5 has a slightly larger screen that is a lot higher resolution, latest KitKat Android, fingerprint scanner, better battery. Here’s Samsung’s official page. Look for CompanionLink 6.0 to fully support Office 365 and Outlook 2013 sync to Galaxy S5 and all related Samsung phones; Active, Zoom, Mini, Mega, Light. Before April, DejaOffice will support the fingerprint unlock, particularly for our encrypted mode which uses high level encryption to lock your contact and calendar data. Also before April DejaOffice will be getting some new usability features; a side-menu for quicker app switching, and better integration with KitKat notifications. Some of these require KitKat or higher OS version. Some features will also be available for lower versions. The new release will get a new version number DejaOffice 3.0. We are about to release DejaVoice. This is a voice dictation system that is intended for voice command, and voice readback. DejaVoice is a standalone system. You can use it like a dictation machine where you speak what you would like to write. DejaVoice is suited to voice editing, where it automatically reads back content, and you can modify it on the fly. Also coming in March is DejaVoice Translate, where you speak in one language, and it reads back in another. This is to assist in communication while traveling. Finally, DejaVoice is also suited for communication for hearing impaired and speaking impaired. Using the dictation and readback systems separately gives touch based controls to create verbal input and output to assist people to function more smoothly. With DejaVoice launched as a standalone product, look for it to be integrated into DejaOffice. This is the promise (and failure) of Siri to be a verbal IO system for a CRM product. Look for a command engine to handle “what are my tasks today?” and also the ability to add, change, delete records, to sent notices to attendees, to quickly map the next appointment and launch directions. Voice commands and CRM together speak a lot to Google Glass, Ford Sync, and other automobile and wearable systems. The integration of your own contact list and schedules make it natural to want to send out messages, reorganize tasks, dictate letters, and make project notes all while sitting in traffic with both your hands on the steering wheel. This is our main goal for 2014 is to integrate all these systems with our realtime DejaCloud Sync which supports PC and Cloud destinations like Salesforce, Outlook, Lotus Notes, Act! and Goldmine. Newkia, the new Singapore-based endeavor with plans to siphon Nokia’s Finnish talent to build Android devices, has its heart in the right place. Had Nokia heeded popular advice and supported Android OS, they would probably still be around as a company that builds phones. They chose to become the near-exclusive manufacturer of Windows Phone, a decision that earned Nokia’s C-brass a fortune in the Microsoft acquisition while thousands of employees and avid followers were stranded. Not to mention the hit on the economy in Finland (here’s another great article on that topic). CompanionLink has long championed the message for the need for a smartphone with business features. We even built our own business-focused mobile app because we saw this gap. Android and iPhone operate exceedingly well with video, social media, and web browsing. But they lack advanced functionality that business users relied on with legacy Palm Treo devices. For example: an address book that shows more than 8 contacts per screen; a notes app that intelligently links to people in the address book; a task manager that fits productivity philosophies like Getting Things Done and Franklin Covey; and full integration with PC apps like Microsoft Office and Lotus Notes where business people spend 50% of their day. OPPORTUNITY ALERT FOR NEWKIA: build business productivity into the fabric of your product roadmap. If you need help with this when building your PIM applications, please call us. We’d love to help. Business users held tremendous hope that Palm webOS would fill this void. The first Palm organization defined mobile productivity. When that failed, business people refocused their hopes on BlackBerry 10. Q3/2013 sales showed BlackBerry sold more legacy devices than phones running on the new OS 10 platform. Yikes! The Address Book, Calendar and Apple-inspired Remember apps weren’t anything like what business users expected from their BlackBerry. Newkia appears to have taken a giant leap in the right direction by acquiring a CEO, Urpo Karjalainen, who understands the business of mobile business. Mr. Karjalainen served as BlackBerry’s head of business operations for Asia and worked another 20 years at Nokia.